Sadly, Stan Laurel and Oliver Hardy, perhaps the greatest comic duo of all time, are largely forgotten today by an internet and social-media-fueled generation whose idea of comic twosomes is Will Ferrell and John C. Reilly or, on the other side of the Atlantic, Rob Brydon and Steve Coogan. Ironically, all four of them appeared in one of the least funny film comedies of recent times, Holmes & Watson. Fate seems to have smiled on two of them at least, for Coogan and Reilly are perfectly cast as Stan & Ollie, a film that gives viewers an idea of the screen legends’ comic genius and their relationship. 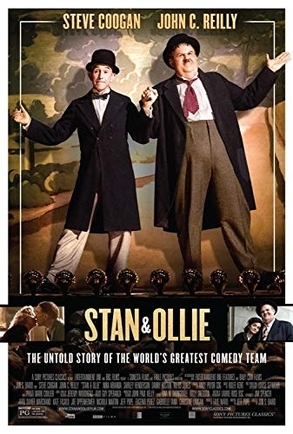 Stan & Ollie does not focus on the pair’s heydays in the 1930s, except for a brief prologue set in 1937 showing them working on Way Out West, one of their best-known films. Although the two were major stars and Laurel’s comic routines were often inspired, neither of them was a particularly good businessman, and shrewd producer Hal Roach (Danny Huston) knew how to take advantage of their inexperience. By staggering their contract expiration dates, Roach prevented them from leaving as a pair and marketing their talents elsewhere. Also, a succession of unsuccessful romantic relationships and Hardy’s losing streak at the race track made them somewhat desperate for whatever they could get from the penurious Roach. Fast forward to 1953, and Laurel and Hardy are considerably older, with their film careers essentially behind them. Both of them have money problems, and Hardy’s health is suffering as he struggles with a host of weight-related issues. Laurel persuades Hardy to go on a performance tour in England, ostensibly to garner publicity for an upcoming film about Robin Hood that Laurel is brokering to a studio. In actuality, there is no movie, as Laurel knows; the English tour is solely for the money. The tour does not start well, as the pair’s somewhat sleazy manager (Rufus Jones) books them into second-rate theaters and third-rate hotels in small towns, playing in front of half-empty houses. Many would-be theatergoers are actually unaware that the pair are still alive, let alone performing locally. Eventually, however, the comic duo begin promoting themselves by making personal appearances, and they gain considerable good press as a result. When they finally reach London, Laurel and Hardy are playing in front of sold-out houses and being feted by nobility. All good things must come to an end, and, in this case, it’s Hardy’s health issues that flare up, with doctors warning him that his life is in danger unless he makes some significant changes. Before that, however, their friendship is also put to the test, when Laurel finally reveals that there never was a Robin Hood movie, and Hardy claiming that the two were never really friends. Stan & Ollie takes considerable liberties with the facts of the pair’s later career. In reality, they went on three separate English tours that were widely successful, and the doomed Robin Hood project fizzled out several years earlier. And, most notably, the dramatics concerning whether the two really were friends was a bit of 21st century Hollywood license (Laurel actively encouraged Hardy to co-star in a John Wayne film a couple of years before the events shown in Stan & Ollie). But historical accuracy is not the point of Stan & Ollie. Instead, it’s an attempt to show the personalities of the two men and to examine just how their comedy worked. By focusing on a stage show, director Jon S. Baird allows the audience to see the precise timing involved in their various routines and how remarkably talented the two were as physical comics (see clip below). The movie contains over fifteen minutes of classic Laurel and Hardy routines recreated by Reilly and Coogan, and these sketches alone are worth the price of admission. 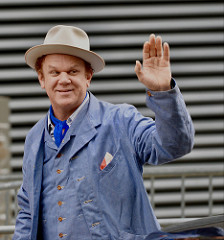 To play Oliver Hardy, John C. Reilly had to don a bulky fat suit, but the makeup work is extraordinary. Both he and Coogan have all the classic mannerisms and the timing down pat. But they go beyond merely doing good Laurel and Hardy impressions. Instead, they work the duo’s shtick seamlessly into their dramatic scenes as well. One of the best moments of the film occurs when the two have a bitter argument during a lavish reception in their honor, at the end of which many of those in attendance sincerely believe that they are just watching a Laurel and Hardy routine. Reilly and Coogan aren’t the only good comic pair in Stan & Ollie though. About halfway through the movie, wives Ida Laurel (Nina Arianda) and Lucille Hardy (Shirley Henderson) arrive from America to accompany the guys on the rest of the tour. Arianda and Henderson make quite a formidable comic pair of their own. They too are a perfectly mismatched comic pair, both with their respective husbands and with each other. And, since they spend much of their on-screen time together rather than with their husbands, the pairing of the brash, controlling, opinionated Arianda and the more demure Henderson works perfectly. In many movies, scenes featuring the leads’ wives would be throwaway filler, but here they are equally humorous changes of pace. Stan & Ollie has two main dramatic storylines, one real and one somewhat fictionalized. Not surprisingly, the fictional one involving the manufactured hostility between the two (which everyone knows will disappear by the final credits) never quite rings true, although it produces an excellent confrontation scene. However, the story of a couple of brilliant comics in their twilight years, calling on all the tricks they’ve learned in the trade to compensate for increasing physical failings and the fickleness of their fan base, is universal. John C. Reilly and Steve Coogan are two highly talented comic actors who channel two comic legends perfectly. Others could undoubtedly have imitated the look of Laurel and Hardy, but this pair has the comic timing and the chemistry down pat. Some of their routines are nearly mirror images of the original Laurel and Hardy scenes on which they are based. Seeing Stan & Ollie doesn’t just give viewers an idea of the who, it shows how and why Laurel and Hardy are enduring comic geniuses, a rare perfect pairing created by a studio and nurtured by two tremendous talents. This is a fine mess of a movie that’s a must for real cinema fans. In this clip, Steve Coogan and John C. Reilly perform a classic Laurel and Hardy routine.